CBS Records (now Sony) had a great classical series of reissued recordings called ‘Great Performances’. This was by far the best of the budget classical series of the 1980’s. These are digitally remastered analog recordings from the late 1950’s up to the early 1970’s. I highly recommend them, and do not think you can go wrong with any of these recordings. The series features conductors Leonard Bernstein , Eugene Ormandy , Bruno Walter and George Szell with the NY Phil, Cleveland Orch, Philadelphia Orch, and many soloists such as Rudolph Serkin. Just a great series, each with a small booklet with information about the works and composers, a nice touch that seems to be lacking in some newer budget lines. The CBS Great Performances Series has been partially discontinued, or had the recordings rolled into the Sony ‘Essential Classics’ series. However, many of these compilations were issued on CD and many are now available as MP3s. The average cost is under $10, and every recording is from very good to excellent. All of the 100 volumes are shown, and some of the out of print issues are still available used or in the MP3 format. The links go to the original edition at Amazon.com, and alternate links forward to newer or in-print editions of the same recordings. Some of the later volumes had some peculiar pairings that were never duplicated in CD form, so there may be several alternate links to find all of the works. A playlist of the CBS Great Performances recordings has been created by a reader, Germán Reyes (thanks for the work!). As per the notes on the playlist, some recordings are not available. They have been replaced by other records of the same works. [LP] links to the vinyl release. Am I right in thinking this is not a complete listing of the Great Performances series? For example I can’t see the Sibelius and Neilsen Violin Concertos with Cho-Liang Lin and Esa-Pekka Salonen. Reissued as part of this series in 2005 I think. Actually, this listing is only for the CBS GP series, I do have a separate page at https://basicrep.com/label-series/sony-great-performances/ that has some of the Sony GP issues. The original CBS series was issued thru the mid 1980’s and was 100 volumes, and before Sony purchased CBS/Columbia. The Sony incarnation is really a different series from around the mid 2000’s, originally available at Tower Records as an exclusive for some years, if I remember correctly. This is not a complete list of all CBS GP issues. I am holding GP Sampler Vol. 1, cat# CDN 43, a Canadian release. Apparently the Canadian releases were not congruently numbered with the the US release (Cat# 43 in the US series is Debussy / Boulez / New Philharmonia Orch: La Mer, Jeux, Prelude Faun), at least this one wasn’t. Other than that, and the possibility of a second sampler, this list does look complete. I have not been able to find any info on this sampler in my hands anywhere on the net. If anyone knows more about this, please reply here. Thanks! Interesting, did not know of the existence of a sampler. Came across a sampler LP for the similar RCA Legendary Performers series recently, but never one for GP. If you have some images of the covers / labels, please send them and I will add the release to the listings, basicrep@gmail.com. I do know of a few other releases that are not part of the 100 volumes, there is a GP 104 for The Nutcracker by Ormandy, a Spanish release [the version from the US is from Bernstein]. Also a Hungaraton version [no volume number] from Glenn Gould of the Beethoven Sonatas. Both of theses are over at discogs.com, and while I am sure there are some others out there for other countries, I have never been able to locate any. Will have to do another search, I compiled the original list years ago thru guessing the catalog numbers [finally found an insert in one of the LPs with all of the releases years later, way too late!]. This was before any lists showed up at discogs or other sites. Images are now posted to Discogs. Feel free to copy what you want. I’ve updated the tracklisting and as far as I can tell, the info is now complete for the release. As far as the Brahms, my copy of the work is not in the GP series, so I am not sure. I do know that the 2nd by Serkin/Ormandy on the original LP release ML 5491 had no other works [I have that one], so I doubt it. As far as I can tell the CD/LP/Cassette issues in the GP series were identical. At the time CBS was not very generous about using the extra playing time on their CD releases. If I remember correctly the Burlesque was coupled with the Schumann Concerto original LP release [will have to find it – nevermind, found it, yep], but that work has a different coupling in the GP release, volume 38. Great – That is now double confirmed. 1st – The Four Seasons – I would just call the entire piece a single opus, but it can be argued that each section (Winter, Spring …) could be a single piece. My preference is to just make it the single unit The Four Seasons. Glad to see you are still kicking! Bryce, your time figure doesn’t make sense to me – assuming 74 minutes per CD (the max length of a standard audio CD and roughly equivalent to the longest vinyl LP) 100 CD’s would take a little over 5 days to hear, not 81. Maybe they’re so good you’re listening to them over and over before moving on to the next. 😀 My CBS GP collection is not complete otherwise I could get the exact figure by selecting my iTunes playlist dedicated to the series. Currently I’m looking for Brahms 1 and 2 (Cleveland/Szell) but can’t find them. Maybe they didn’t come on CD, in which case I should starting looking for them on vinyl. I have the means to make very good transfers from vinyl to iTunes, so that’s no problem – in fact, many of the albums in my CBS GP playlist are from vinyl. My first CBS GP was Brahms 4 (again, Cleveland/Szell) on LP in college, purchased in order to familiarize myself with the piece for an upcoming performance. It’s still one of my favorites. BTW the Brahms 1 and 2 did get released on CD, check the links above for volumes 62 and 63 and will take you to the CD release of the albums on Amazon. Thanks, Jim! I just ordered them. I don’t know why my searches on Amazon and eBay never turned them up, but your links took me right to them. Hey, just wanted to thank you for this list, which I used when I was first compiling information on the series. It was a huge help when I was getting my bearings. My first one was bought back when the series was current and I was a teenager, in the early ’80s: a copy of No. 25 (Holst, “The Planets”) on cassette. One correction that I would make to the list is for Number 76. In the Great Performances series, this is actually the Schumann Symphony No. 1 “Spring” & No. 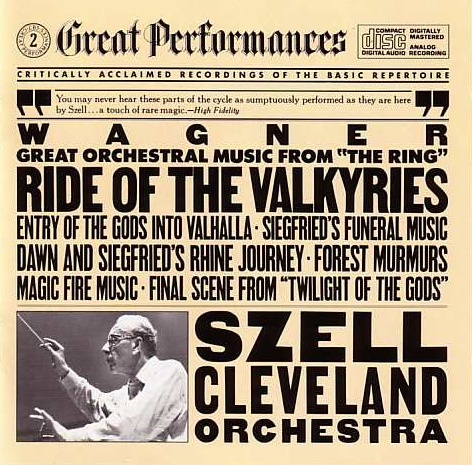 4, with the Cleveland Orchestra conducted by George Szell. I’ve found this one on CD and cassette, but it’s one of the two in the set that I’m missing on LP (the other is No. 100, the Prokofiev / Kodaly pairing). You can confirm this with the printed inner sleeve advertisement in any of the LP releases from 1983 (roughly after No. 70): that give a complete listing of the issues in the series. I’ve been keeping track of the cost as I’ve acquired the LPs, and typically they’re around $6.50, postage included, which is great if you have the appropriate equipment to play them. I’ve gotten mine from eBay, the Amazon Marketplace, and Discogs, with a fair few being found at my local Half Price Books for around $3 each. I’ve gotten several that were still sealed and clearly from bargain bins, marked at “3 for $10”, which would’ve been nice back in the day! The majority have been in excellent condition and play without any distortion even after thirty years, although I’ve gotten a few that I’ve been less than thrilled with. I’d be interested to know who else has been having trouble tracking down their last few issues. Some of them seem rarer, like No. 91, the Elgar Enigma Variations / Pomp & Circumstance, but I haven’t seen any that I would feel compelled to fork over the sometimes extortionate prices that some Amazon sellers list several titles at (including the Elgar). I believe that the most I’ve spent for any one copy was $20, and that was for sentimental reasons, as it was a sealed LP copy of the Holst with which I started my collection. Turns out, the eBay seller only lived about 15 minutes from my house. Weird. I suspect that hoppkorv’s Canadian sampler is just that: a Canadian in-store demo. There could have been one in the US market too, I suppose, but I’ve yet to see any evidence of it. Not all markets retained the same numbering (e.g. ; Yugoslavia, Argentina, et cetera), but the Canadian releases that I have in my collection correspond exactly to their US counterparts. The only difference is a slight colour shift and a slightly heavier bond cardboard for the sleeve, along with a translation of the sleeve notes included as an insert in French. Anyway, thanks again for this list. Thanks for catching the typo, must have copied something wrong when doing the index. I figured the releases like the sampler were promotional items, and the other releases that are not part of the US 100 were probably re-releases that were just added to the series for those countries as a matter of convenience as far as packaging goes. I just found recently a sampler for the similar RCA Legendary Performances series, did not even know about that one. Never seen any for GP, was surprised when the Canadian LP was brought to my attention. I have about 2/3 of the releases on LP and CD [my cassette releases went bad years ago], and the rest of the recordings in different albums. I never saw the later ones in the stores at the time, so not sure if they were in print very long. I do know the lower number volumes are more plentiful, but like you I tend not to spend too much acquiring missing issues. Maybe one day I will finally get the whole set. By the 80’s CBS had really good pressings and their remastering of older recordings seems to me the best at the time. There are a few volumes that were not so great [like 88, the Handel suites were not complete recordings] but overall I think as a whole it is about the best series of the ‘basic’ symphonic works. I picked up 4 volumes I did not have for a buck each a while back at Habitat for Humanity, so you never know where they will show up. I do miss the days of record stores, looking for that one record week after week, or finding a treasure that you did not know about! The things I discovered by browsing LPs made up a large part of my collection, was never quite the same when CDs came out. My cassette copy of Holst still plays without any serious flaws, or did last time I tried it a couple of months ago. Not bad for something I bought around 1982. Unlike the other cassettes that I’ve found on eBay more recently (new, still sealed, for $2 or $3 each), my Holst copy has a piece of paper folded down to a tiny square as an insert. Unfolded, the insert completely reproduces the back of the LP sleeve! Do you remember if any of yours were like that? From the few of the series that I had before I re-started my vinyl collection, I’ve assembled a nearly complete set in about a year and a half. I’ve tried thrift stores without success, but I’ll need to look in at the nearest Habitat the next time I’m out – that’s a great idea. It’s evident that other people out there do buy them: a stack of five or six at my local Half Price Books were gone when I went back a month or so later. Best of luck in completing your set, and thanks again! Don’t have any more of the GP cassettes, they gave up years ago. Don’t recall any liner notes, probably why I did not buy many of them. The only cassettes I ever recall having liner notes were the Nonesuch re-releases in the 1980’s, they had the folded paper insert. I usually purchased bargain line cassettes just to listen in the car, etc. most of the time, and few ever had much info except a track listing. DG Doubletape, CBS Odyssey, etc. Most have gone bad, especially the London ones, they did not use very good liner on the inside, and the lubrication has gone bad over the years so they squeak and slow down a lot. Could put them into new cases, but that is always a tricky proposition. Most have been replaced anyway with vinyl or CD. There are no real record stores around here either, just one that has rock, pop, etc, haven’t been there in ages. I remember a few stores in the day had a separate ‘classical’ room in the back, behind glass where you could listen in relative quiet. But even Record Bar would have racks and racks of classical music, and you are right, last visit to BN had almost no classical that was worth getting. Until a few years ago they were the last ones that had any classical CDs, but guess they had to make room for more DVDs and Blu-rays. C’est la vie. Thanks for this list! I was in a record store in Canada recently and didn’t know anything about the series, but bought eight albums from it. Only paid about $3 each and they’re in excellent shape. I look forward to collecting more. Thanks for the radio station tip, will give it a listen. Believe it or not most of the volumes are still out there, I run into them from time to time, just recently bought one for a dollar that I did not have yet. Not bad for a series that is over 25 years old! and I am selling it as a single lot on eBay. 60 of the LP’s are sealed.Rest are NM. place a referral to your site on my listing. Louis – Sure, not a problem. Feel free to use any of the info you would like. Great site, Jim! I use it all the time. It’s unfortunate they edited some of these, and cut out sections of the music. For example, Beethoven’s 5th (Bernstein)… the entire intro (first 1min 40secs) has been cut out of the “Great Performances” version. Also, the 4th movement has 2 minutes stripped out in the middle and edited. Movement 2 and 3 are complete and intact. I suppose it was done to fit it on vinyl, but the CD version also has the edits. I’ve made a list in Spotify. Some recordings are not available. They have been replaced by other records of the same works. Thanks so much for the playlist.